I’m still baffled about how there are lawyers out there who seem oblivious to Section 230 of the CDA and how you can’t just sue a platform because of something a user did. 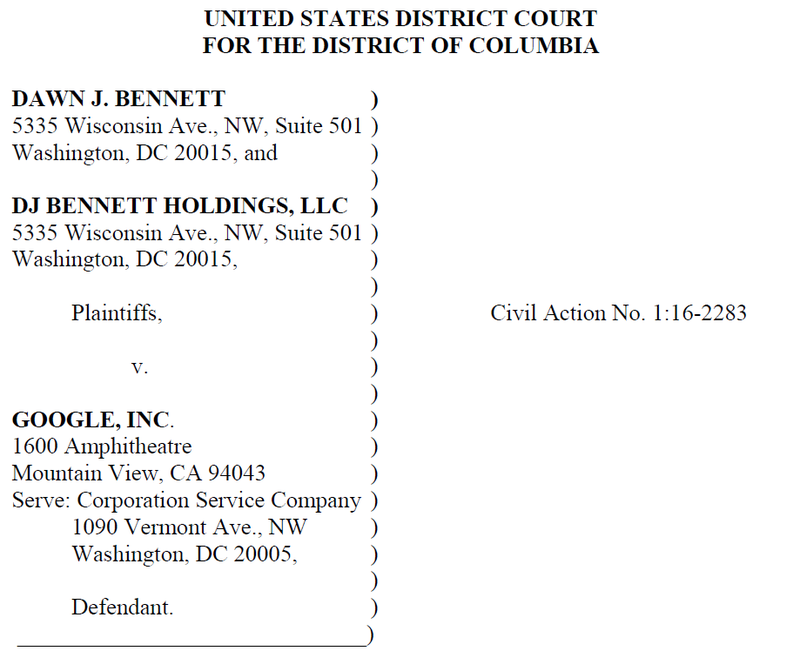 Apparently lawyer Harry J. Jordan from Washington DC is either unaware of the law, or simply decided to ignore it, in filing a silly lawsuit against Google asking for $8 million on behalf of Dawn Bennett and the “sports apparel” firm she runs called DJ Bennett. The story is a fairly familiar one. A guy named Scott Pierson claimed to be a Search Engine Optimization (SEO) expert, and convinced Bennett to pay a large sum of money to improve the performance of DJ Bennett’s website. Things didn’t work out, there was an exchange of words, some threats to negatively harm the website and an agreement on final payment (and also something about a lost check that was eventually rectified). Bennett claims that after all of this Pierson set up a blog on Google’s blogging platform that made a bunch of negative remarks about DJ Bennett, some of which may very well be defamatory. But, do me a favor, and look at the caption on the lawsuit, and tell me where Scott Pierson is as a party to the lawsuit? Google continued to carry Pierson’s blog after plaintiffs’ counsel repeatedly alerted it of the factual distortions and malicious intent of Pierson’s blog and his abuse of the internet process to distort public interest in his blog. Google therefore shares in the responsibility with Pierson in plaintiffs’ financial damages. Plaintiffs will show at trial that they have lost more than $3 million in actual and potential business revenue because of Google’s publication of Pierson’s blog, and separately, Dawn Bennett has suffered several times that amount in damages to her business and professional reputation. Right, see, that’s not how this works. Just because Google hosts a blog, it doesn’t make it liable for anything posted on it. And that’s true even if you alert Google to not liking content. Hell, it’s even true if the content has been proven defamatory in court (though Google tends to take things down upon receipt of such a ruling). I can understand why Bennett is upset. But if the content is truly defamatory, then sue Pierson, who is responsible for it. And the lawyer — Harry Jordan — should let her know that Pierson is the only one she can sue over this, and should know that any attempt to sue Google will get tossed out of court super fast. But instead, he pushes forward with this lawsuit — and doesn’t even make the slightest attempt to get around Section 230, suggesting he may not even be aware of it. A defamatory statement is one which tends to expose a person to public scorn, hatred, contempt or ridicule, thereby encouraging others in the community from having a good opinion of, or from associating or dealing with that person. To determine whether Pierson’s blog meets this standard, consideration must be given to what was stated, what was intended by the statement, and how it was likely to have been understood by those to whom it was communicated. That’s uh… not what defamation is. Notice that critically missing here is any question of whether the statements are false. A mere statement that exposes someone to public scorn, hatred, contempt or ridicule (assuming it doesn’t reach the actual tests for defamation) is clearly protected speech. Just for reference, Washington DC’s actual defamation law requires a very different standard, including (as it must) that the statements be false and defamatory. Furthermore, corporations are considered public figures, meaning that the test also must include the “actual malice” standard (which, for all we know, could be shown), but it would still need to be shown against the right defendant. And that’s not Google. The lawsuit makes similar and equally problematic claims about “tortious interference” and “intentional infliction of emotional distress.” Those are also clearly inappropriate under Section 230. And again, the link to Google is exceptionally tenuous. As Google was aware of plaintiffs’ complaints that Pierson’s blog was factually false and a malicious vendetta against them and meant to cause crippling financial damages, it is therefore equally responsible and liable for the damages plaintiffs’ have suffered. Nah, that’s not how it works.